Four Patch quilt block patterns are among the most popular patchwork quilt block designs. The most basic four patch quilt block is just what its name implies, a quilt block made with four patches of fabric, all squares, and arranged in two rows of two squares each. When you begin to examine four patch patterns, you'll discover that those four simple patches are very often subdivided, sometimes more than one time, to create intricate designs. Take a look at my tutorial to learn how to identify four patch quilt blocks and other patchwork arrangements. 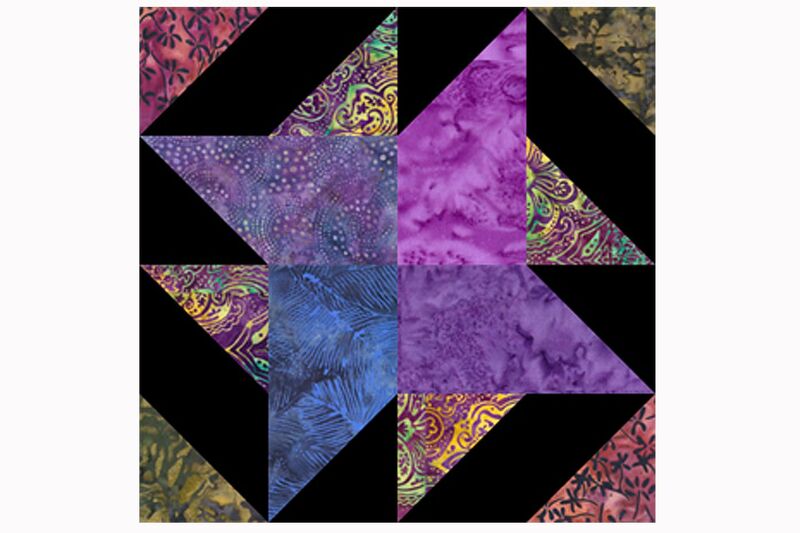 This pinwheel quilt block is made entirely with quick pieced flying geese, but with triangles sewn in a different configuration than is typical for geese. The block is very easy to sew and looks good sewn in either a color-controlled theme or as a scrap quilt block. I like the black background against bright batik fabrics, but any theme will work perfectly. Yes, the name includes the words nine patch because a nine patch unit is the focal point at the center of this quilt block. But overall this is a four patch design. Turn the green and cream flying geese units around to make the blocks look like a star. That's an option with many other similar blocks, including my Evening Star with a Nine Patch Center. Carrie Nation helps you create diagonal pathways throughout the quilt, and you can do that on both diagonals. Make one more dominant (like the small dark squares in my example) and the other with a bit less pop. You'll always discover lots of ways to arrange blocks like this, often called 'chains' or 'linking' designs. Oddfellows Chain is a large quilt block that can be used for any purpose, from wallhangings to quilts to fit beds of all sizes. The block isn't difficult to make but do take care when placing the individual triangles illustrated on page 2 of the pattern. Little Oddfellows Star Miniature Quilt Pattern - I won't tell you that this quilt is easy, but paper piecing techniques help you sew it accurately. Use my Slotted Spools quilt pattern to make either a 6" or 12" quilt block. Your background needn't be black -- this patchwork layout will work with any type of fabric. Blocks are easy to construct, even if it's a very first project. Sewn entirely from half square triangle units, Depression is a quilt block that can be used for either a scrap quilt or a quilt with a controlled color scheme. You can flip the contrast around too -- put darks where lights are shown and replace the lights with darks. It's super easy to do that in a preview and easy to mix both types of layouts in the same quilt. To make a scrap quilt, choose a block size (four are included in the pattern) and sew random triangle square units whenever you're in the mood. Accumulate the squares until you're ready to use a quilt design wall to establish a layout. Old Fashioned Wedding Ring is similar to the Depression quilt block but is a five patch layout. Rolling Stars is one of my favorite quilt blocks, and was inspired by a photo on a quilt barn. It's similar to many other quilt blocks, other than the tiny little 'Snowball' tips at the corners of its center square. Flying Dutchman is simple to assemble when you use the no waste flying geese method to create its patchwork. The design is versatile, and can be used to create any theme. If you prefer, make those center triangles really pop, with others falling to the background a bit. Light triangles on a dark background would work, too. This 12" Sailboat design is one of the many boat quilt patterns I've written for the web site. It's easy to construct, and beginners should have no problems at all making quick and accurate boats. Some of the other sailboat block patterns are the same size, so mix and match the designs to create a custom quilt. Choose from four finished block sizes when you make Double Hearts. I designed the block for Valentine's Day, but it's is becoming more and more popular even though that date has passed. Hearts are the perfect way to send love, and with multiple sizes to choose from, it's possible to choose a block to suit the scale of any quilt, from a miniature to a baby quilt to a design for a bed. Try shifting the contrast a bit, and change fabrics to suit your needs. The blocks on this page represent some of my four patch patterns, but certainly not all, and the links don't attempt to cover four patch layouts found in my quilt patterns.